The Potty Train has arrived at our house for, I believe, the last time. Munchie has resisted our efforts up to now, but on Saturday he began to get it. He is still not perfect, but he knows when he needs to and lets me know if he doesn't need to go. So tonight I bought him a Potty Train balloon. With Crunchy and Munchie it became an offence to my professional pride. You see, I have a certificate on my wall at work that not only identifies me as a "Developmental Specialist", there is a II (2) behind it. I ama so-called expert, but my kids were 3 years, 1 month; 4 years 2 months; and now 3 years 10 months when they mastered the potty. I remind myself (as well as the parents I work with) that kids develop at different rates. Just like some of us. We all develop (and continue developing) at different rates. Ha, well I'm not specialist, but I realized that my daughter's 3rd bday was approaching in a couple of months and it was MY fault that she wasn't trained. Since she was my only child, I didn't mind the diapers. I hated to see that phase pass. Once I decided to follow through, she was trained in no time. I'm sure all kids train in their own time. The potty train idea is too cute. I have My giveaway wednesday up! Make sure to list your giveaways! I am a highly capable mom and had a difficult time with potty training. My kids were 4yrs, 4.5yrs and then finally #3 decided to make it easy on me and potty trained @ 3.5yrs. I just don't have the patience for it - despite all my attempts. Ah... I'm so glad we're done though. 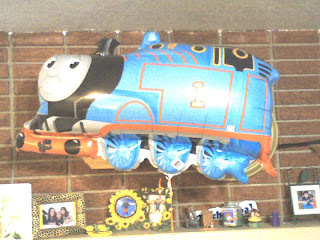 Love the Train balloon! I will have to try that one! Thanks for the comforting words to another frustrated potty training mama! YOur so right that all kids are different. My nephew was almost 4 when he trained, and I have heard of many who trained before 1. I find it a bit hard to believe, but taylor wasnt far from that. Keep up the good work and know that those diaper das will be over soon!